Zynga just filed its legal response to Electronic Arts’ copyright lawsuit. The response has three parts: A motion to strike portions of EA’s suit; an “answer and demand for jury trial” on other portions of the suit; and a counterclaim from Zynga. Today we responded to EA’s claims which we believe have no merit. We also filed a counterclaim which addresses actions by EA we believe to be anticompetitive and unlawful business practices, including legal threats and demands for no-hire agreements. We look forward to getting back to focusing all our efforts on delighting our players. The truth is that despite years of trying to compete, and spending more than a billion dollars on acquisitions, EA has not been able to successfully compete in the social gaming space and was losing talent, particularly to social gaming leader Zynga. Desperate to stem this exodus, EA undertook an anti-competitive and unlawful scheme to stop Zynga from hiring its employees and to restrain the mobility of EA employees in violation of the spirit of the antitrust laws and California public policy. EA sought, by threat of objectively and subjectively baseless sham litigation, what it could never lawfully obtain from Zynga – a no-hire agreement that would bar Zynga’s hiring of EA employees. Some of our people will always leave. But they are leaving for one place — Zynga. … I get that they can reach out. The question is what happens when they do. Listen and send them back to me, or their boss at EA. Or, listen, nod and lend a hand…. We are crossing into a place I don’t think we want to be… But I believe you can and should find more talent outside of EA. EA’s General Counsel communicated to Zynga that Mr. Cottle’s departure had intensified EA’s concern about losing talent to competitors and increased Mr. Riccitiello’s wrath toward Zynga by again making him look bad to his Board, shareholders and the gaming community. … Mr. Riccitiello was placing “extraordinary pressure” on the EA legal team to finally obtain a go-forward no-hire agreement – unrelated to Zynga’s hiring of Mr. Cottle – that would prohibit Zynga’s future ability to hire EA employees. If Zynga refused to agree to the no-hire, then Mr. Riccitiello wanted Zynga to know he would file an objectively and subjectively baseless sham lawsuit against Zynga for the express purpose of chilling Zynga’s future hiring of EA employees and discouraging EA employees from seeking out or accepting employment with Zynga. In other words, it’s easy to make Zynga look bad with all the complaints that have surfaced in the past around how it has allegedly copied competitors’ games, so the company wants the court to ignore all that other stuff and focus on The Ville vs. The Sims Social. As for that central question, Zynga points to its own games YoVille and Cafe World, which came out before The Sims Social, as clear antecedents to The Ville. It also says that certain elements of those games, such as “sitting on a couch watching TV, taking a shower, and going to sleep in a bed” are not protected by copyright. 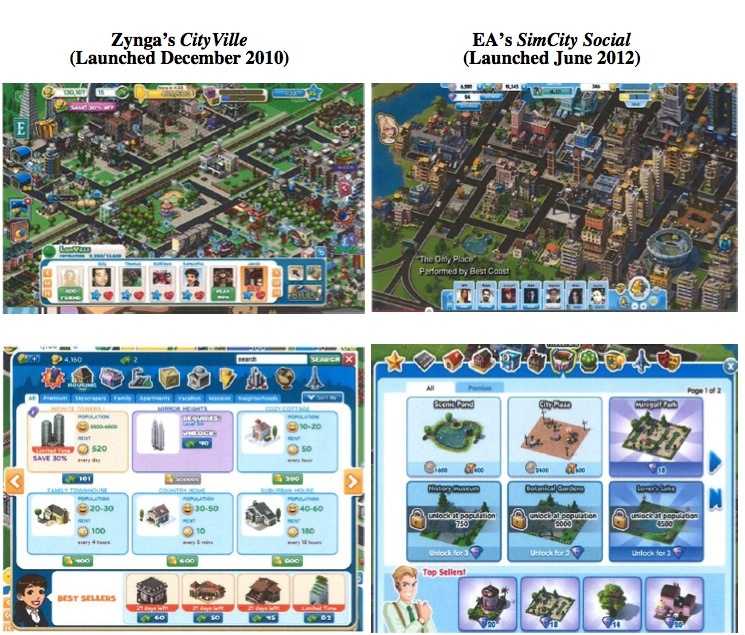 Then, in a “turnabout is fair play” moment, Zynga argues that if The Ville is a copy of the The Sims Social, then EA’s SimCity Social must be a copy of Zynga’s CityVille. You can see Zynga’s comparison of the two city games below.